With Easter around the corner, it is time to bring Easter to your kitchen! 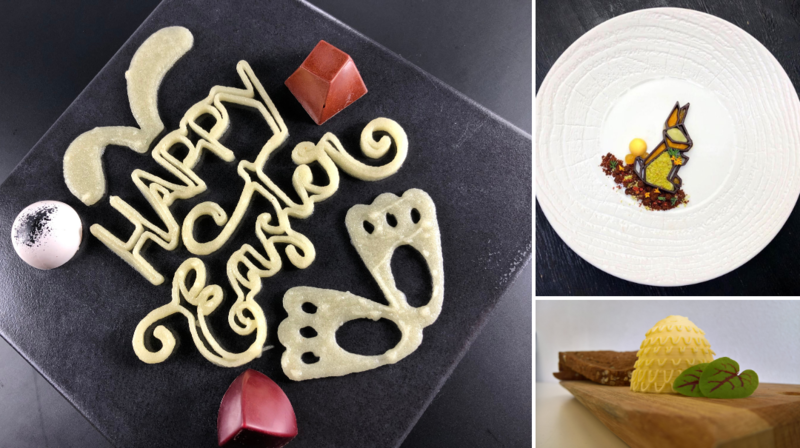 Read this blog to find out how you could use butter, chocolate and various fruit mousses to create your own, unique, Easter food! Families with children may decorate boiled eggs with paint and confetti, for example. Adults hide these eggs around the house for children to go look for them. Sounds common, right? “Easter egg hunts” are really a thing though in the Netherlands. Children are told that the mythical Easter Bunny hid the eggs for them… But not only kids prepare themselves for a good hunt; even young adults and elder people like to dive into the garden. Another fun fact of Easter in the Netherlands: lots and lots of different kinds of chocolate eggs are involved. You can even find Easter eggs with small pieces of the famous, Dutch syrup waffle! So, food became kind of important during Easter. 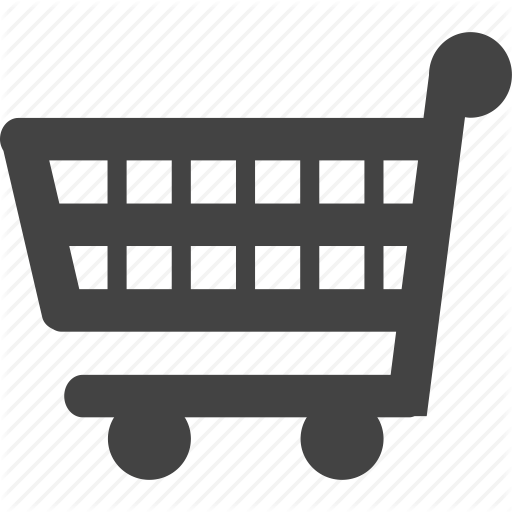 It is an excuse for many people to prepare the most amazing dishes for their beloved ones or to get dressed up and choose an extraordinary restaurant or café to let someone else taking care of some good food. What if people dó come to you for a great brunch, lunch or dinner during Easter? They will expect a special menu with ‘Easter Food’. Lately, people count on something new, something that will surprise them. 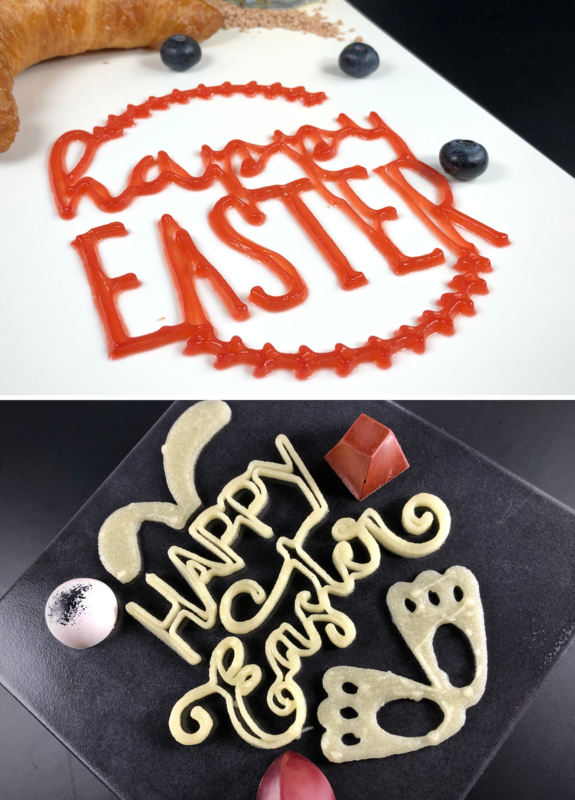 What in the world would amaze customers better, than printed Easter decorations, with a personalized touch of yourself?! Our designers have been busy with creating surprising Easter decorations for you and your guests. 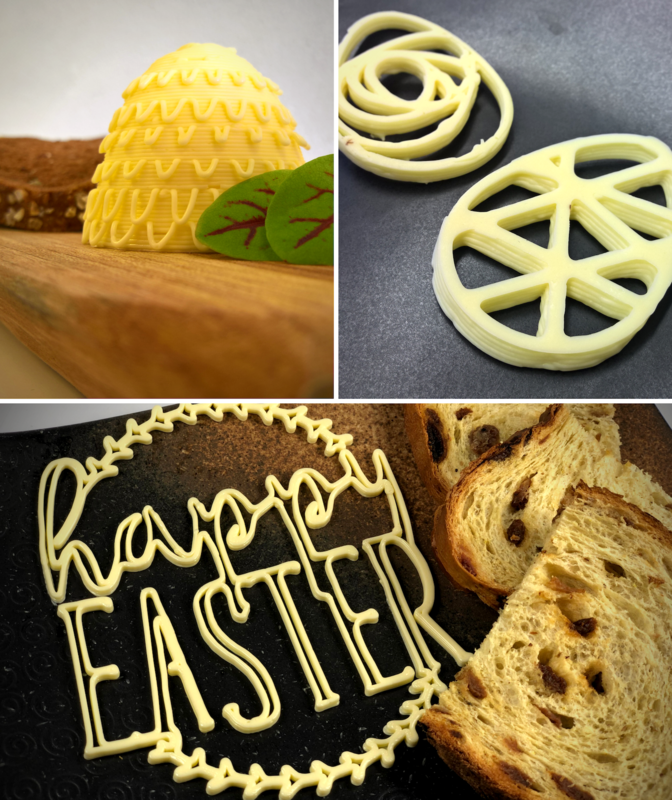 These designs can easily be printed with your own Focus 3D Food Printer in your kitchen and will be done in a few minutes. You can find some Easter designs in our Design Collection, which you can use and/or finalize yourself by using byFlow Studio. Let’s get inspired for Easter! We’re going to kick off with something nice and simple. Easter without a peace of Easter-, raisin- or sugar bread with butter… Not going to happen! Arts of butter can be used for breakfast, brunch, lunch and ofcourse for dinner as well. It is just a little bit different than the well-known Easter butter lamb. You can use the byFlow Studio to create your own shape or a nice message for your guests. Decorate your chocolate shapes with more chocolate! Create thin layers, dots or a creative pattern made of a different kind of chocolate. Print your patterns on top of your chocolate shapes, et voilà…. Masterpiece! You can put a plate with these on the table whenever you feel like; no one minds some extra chocolate sweets during breakfast, brunch or lunch! Amaze your guests with the sweetest shapes on their plates. We made these shapes with chocolate but you can also choose for shapes made of ganache, or maybe even meringue or cookie dough, to give your shapes some crispiness. 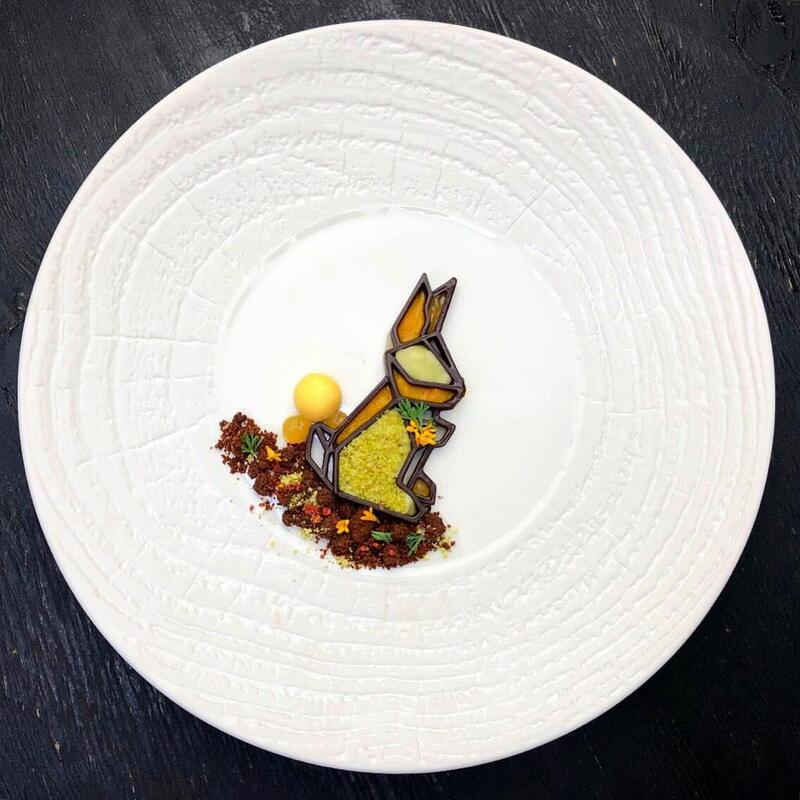 You can add your personalized shapes to every meal: it is suitable for breakfast, brunch, lunch ánd dinner as well! You don’t like empty decorations? What are you waiting for… fill them up! Fill your Easter Eggs or Bunnies with your own recipes. Think outside the bunny box and experiment with different colors and flavors to fill it properly. Put the right ingredients together to surprise your guests. You can serve your filled piece of art as a starter or as a dessert. Happy Easter! A sweet, sweet message is never a bad idea and there is nothing sweeter than an Easter wish made of your home made jam or fresh mousse made of pineapple, bloodorange, strawberry, raspberry, mango and other kind of fruits. Start experimenting with fruit and design a message your guests won’t forget! That was it for this Easter. If you need a little help with creating your designs, you can always reach out for us. We are very curious to your Easter designs, so don’t hesitate to share your ideas with us and the world!